Awards are nice and all, but back to the business of saving money. That's what I'm really here for. I think my brain has been pickled. I couldn't decide which pickle recipe to put on today's blog, the zucchini bread and butter pickles or the green tomato dill relish. After much back and forth, I realized I can always put the other recipe on tomorrow. I've been standing over the vinegar vapors far too long, I believe. 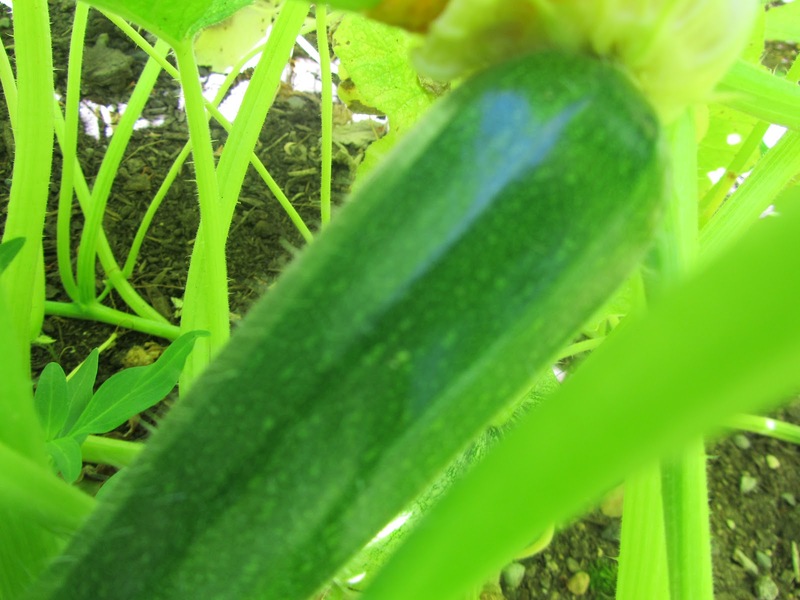 Still inundated with bushels of zucchini? Want yet another way to use some of them? My garden struggles to produce cucumbers. So, for pickles I use green beans and zucchini. I waited all August for zucchini this year -- it was such a cool summer. But now they're here! Pickle-making time again. This recipe comes from my friend, Jayne. You may remember her rhubarb pie recipe from a month ago. Well, her zucchini bread and butter pickle recipe is equally delicious. Sterilize jars (3 pint jars -- 475 mL each). Have ready, as this process goes quickly. Drain thoroughly. Add 1 or 2 sliced onions. Set aside. In a large, non-reactive pot, combine 2 cups (400 g) sugar, 2 cups (475 mL) vinegar and 1 (5 mL) teaspoon pickling spice (or 1/2 teaspoon (2.5 mL) each mustard seed, celery seed and tumeric). Bring to a boil. Add zucchini and onion slices. Boil 10 minutes. Spoon pickle slices into jars, and cover with liquid. Seal and water bath process for 10 minutes. Can be eaten next day, if desired. Need ideas for using extra pickle brine? Click here. Now, what if you're not interested in canning, you can still make a partial batch of these pickles and keep as you would refrigerator pickles. Make a third of a recipe. Use any jar or container you have to keep them. No need to water bath. They can be eaten next day. Store in refrigerator. Eat within one week. These are fantastic on sandwiches. This is the recommended proportion of salt to water for most pickle making. For every 1 gallon of liquid, dissolve 1 1/2 cups salt, or for every quart of liquid use 6 tablespoons of salt. For this recipe, for your first step of a brine soak, you'll probably find 3 tablespoons of salt and 2 cups of water to be sufficient. So what are you doing with all your excess zucchini? Do you have any favorite recipes that use zucchini? Believe it or not, our zucchini are almost gone and I miss them already. I have one left and hope I can get to it soon. It's been a busy week. It is amazing how different all our climate zones can be in this vast country. I do forget just how big the US is sometimes. What are your plans for that lone zucchini? Make it great so you can savor the memory! It's a long time till next summer. Sorry this post is too late for you. But if you don't have a recipe for zucchini bread and butter pickles, copy this one and keep it in your files to try out next year. They are quite good. And as zucchini is so abundant in the garden and fairly cheap in stores in summer, this makes a very frugal and easy bread and butter. I am salivating over the thought of opening one of my jars. My favorite way to eat bread and butters is just as the name implies -- bread, butter (and it's got to be the real thing for this) and some pickles. Yum! Gardens have more or less quite producing here. Just gets too hot. However, I will keep these in mind for next year. Hubby and I are debating if we will plant a garden and if so -- the eternal question -- how large of one? Now that is a foreign concept to me -- the weather becoming so hot a garden stops producing! Here in the maritime northwest, we welcome any heat we can get! Oh well, different regions have different climates. I have a great zucchini relish as well as a zesty zuke relish recipe that we enjoy. I am not especially a fan of zuke, finding it to be bland, and preferring yellow crookneck squash. We love zuke relish, however, and can't tell that the relishes aren't made with cukes! I love the yellow crookneck, too. It has a "meatier" texture than regular zucchini. I usually plant a mix of zucchini, yellow crookneck and patty pan squash. The yellow crookneck has shown no signs of fruiting this year. But we've had quite a lot of the patty pan and now the zucchini. It's an easy recipe, and they're ready as early as the next day, making them one of my favorite pickles to make. In some years, I've even bought zucchini to make them. Even with buying zucchinis, making a jar is still cheaper than buying a jar of pickles. Hope you enjoy them!